Day 4 on our Empress of the Seas Cuba cruise had us in Cozumel Mexico. 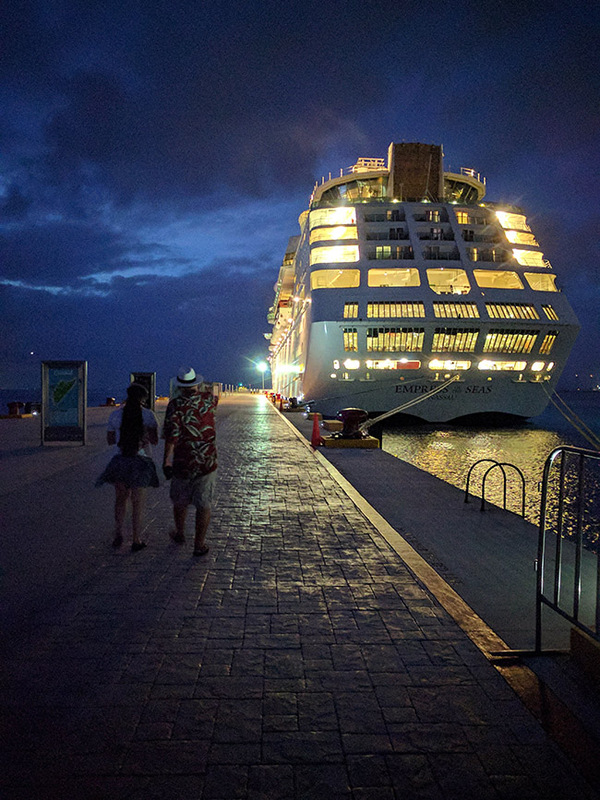 We've been to Cozumel many times before and it feels a little bit like home whenever we visit. Visiting a fun and familiar destination today softened the blow of leaving Cuba yesterday, which was of course a major highlight of our journey. We'll take a look at our arrival, where we went, and look ahead to our next day on board. We were not scheduled to arrive in Cozumel until 1:00pm today, which is the latest we'd ever visited. There have been a number of times in this and other ports where we come back to the ship at the end of the day and find a ship that wasn't there in the morning. This time, we were that ship to the folks on Liberty of the Seas, which was the other vessel in port today. 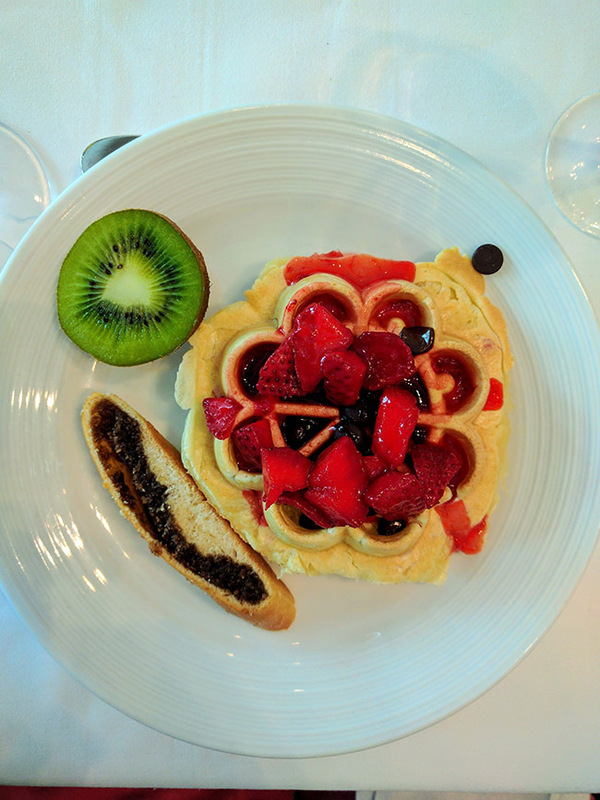 Because of our late arrival we were lucky enough to once again get to enjoy brunch in the main dining room. Arriving a few minutes before the dining room opened at 9:30am there were many people waiting, mostly because we turned back the clocks one hour last night, and many people failed to realize this, so the thought it was an hour later than it was. The doors opened a couple minutes early and everyone piled in. We sat at a large table with other guests, which is usually something we avoid, but we were in a hurry. We did the same on the day we visited Key West, and both days were fortunate enough to sit with some friendly folks. The selection was different from a couple days ago, but the overall layout and concept was the same. 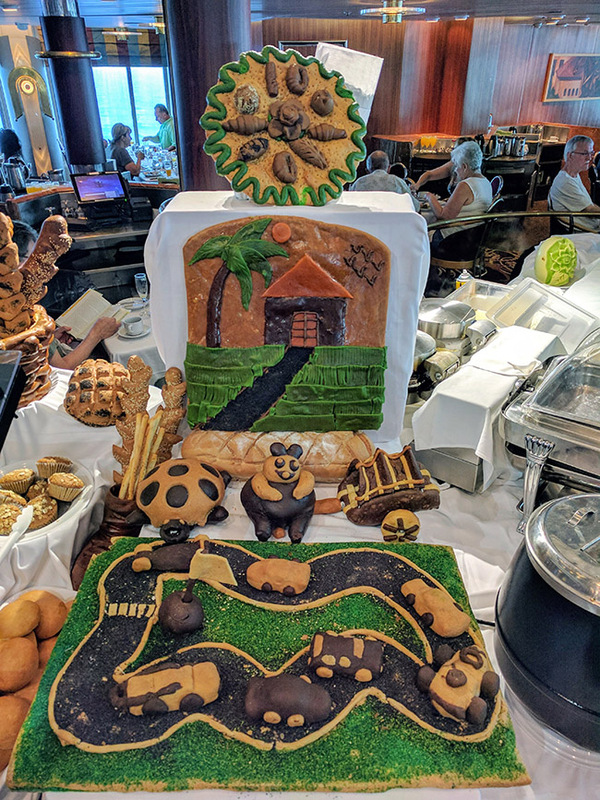 There was some bread art, which wasn't't going to win any awards, but was neat to see. After eating we headed to the pool deck to grab a drink and enjoy the bright sun and views of the turquoise water of Cozumel. Empress' age, while of no detriment, seems to manifest in ways other than the physical structure. For example, as we moored in Mexico the pool band was playing classic Caribbean cruise songs like the "Dollar Shuffle" and "Hot! Hot! Hot!". I'm not a big "party person" but hearing these songs while sitting in the sun reminded me of cruises when I was a kid, and it really felt nice. I took a short video and then jumped on Periscope. 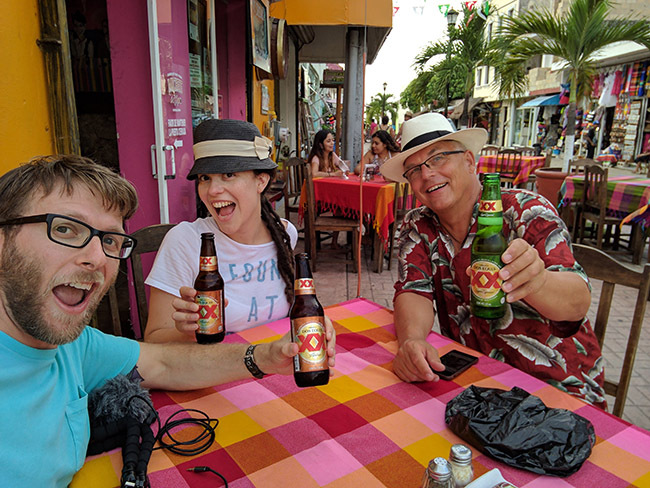 We chatted up an Aussie group we' encountered before and offered up some tips for Cozumel. As we did this, the Cruise Director informed everyone via the PA system that the island was experiencing a power outage. I was quickly glad I'd brought both USD and Mexican Pesos along, as it seemed credit cards and ATMs may not be an option. At this point we decided power or not, we should go enjoy the city, so we headed off the ship. Disembarkation was once again painless; in a no time we were in a cab heading to Parque Benito Juarez to get some espresso at Coz Coffee. Just before we arrived at the square we noticed some street lights on, and sure enough when we'd arrived at the square power had been restored. We got some great coffee and chatted for a bit. I've mentioned it before, but do try and stop by Coz, they roast coffee on site and have a nice establishment. Their location is nearby shops ad restaurants, but also an area that has some local flare, and we even saw some schoolchildren playing, then getting a soda at a shop next door. Continuing with our day it was after 2:00pm and time to get food. Initially we walked the The Pub, another favorite spot of ours which is just a block or two from Coz, but we arrived to find they're closed on Tuesdays. Needing to find another spot to eat and relax I remembered that some time ago Matt and I researched a restaurant a ten-minute walk from The Pub, but hadn't enjoyed as it was closed that particular day. 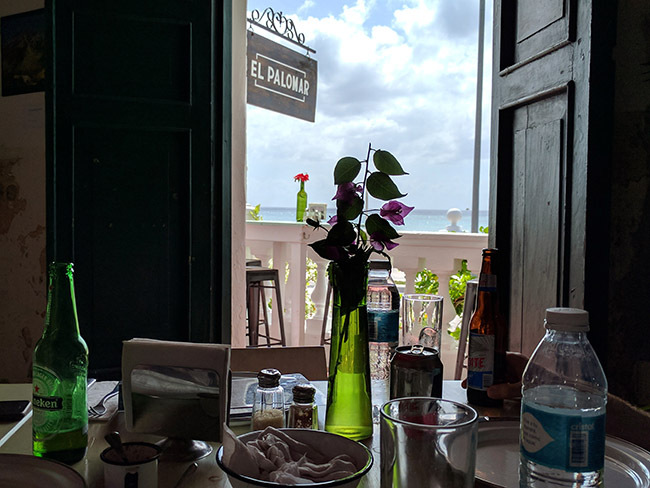 My mental map of Cozumel served us well and we arrived at El Palomar. The food was reasonably priced and was a bit more high-end (though not overly fancy) than some other places in the area. Among other items, we had a cold avocado soup that I'll be thinking of for time. I don't usually like cold soups but the flavor and texture was fantastic, and small cubes of queso fresco and tortilla strips made the dish something that really stuck out. Oh, and this may have the beginning of a lot of Mexican beer. After a few drinks, we wanted to go for a walk and seek more adventure, and a grocery store. On this walk we went into a souvenir shop for $1 beers, and the promise of "different crap, better prices" by amusing shop owners, which was a common and funny line in the touristy areas today. I should have mentioned earlier than this entire trip we dragged our friend Ron along with us. When we travel, we love going to grocery stores to see how locals live, and you can often find some bargains. We'd visited the Chedraui grocery store before, but we wanted to show Ron what prices look like outside of touristy spots, though the store is only a couple minutes walk from the port. After seeing liquor for half of what it goes for at the port, tons of fresh vegetables, prepared and bulk items, etc we bought some ibuprofen (not for any special reason, we just needed ibuprofen) and I then realized that I had a mission to complete. A good friend has terrible migraines, and the medication which helps he is almost $900 in the US, even with insurance it's hundreds per dose, so we offered to try and get some at a lower price. They didn't have it at the grocery store but they recommended a larger pharmacy down the street. The helpful folks showed us to the medication but they didn't have it in the right form unfortunately. For the record, it was however about a tenth of the price. We're going to see if we can order it ahead of time in the right for and get it the next time we visit Cozumel (which is rarely far off). After our pharmaceutical excursion (which sounds far more exciting and nefarious than it was) it was time for another beer. We'd passed "Machete" a number of times in the past but hadn't tried it out. The restaurant has bright colors and an amusing staff. This is probably a gross generalization but I'm encouraged when shop, bar, etc has their prices in Pesos rather than dollars, that often represents a better deal (not that they won't take US dollars). 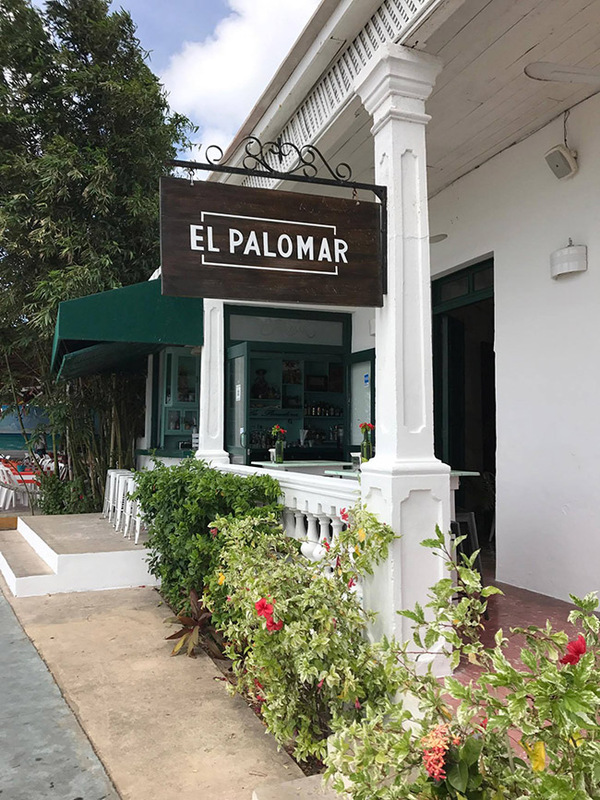 We sat down after checking the menu and I asked in Spanish if they accepted credit cards to which the gentleman replied, "tarjetas (cards), effectivo (cash), iPhones, cars, whatever you want". This is when a pretty epic Periscope started. This was another one of these zen moments. Locals were walking by, there was a nice breeze, staff was having fun with us, and we got to share with our friends online, and of course, beer helped as well. I think we sat and chatted for almost two hours, but eventually the sun began to set and it was time to head back to the ship before the 8:30pm all-aboard. 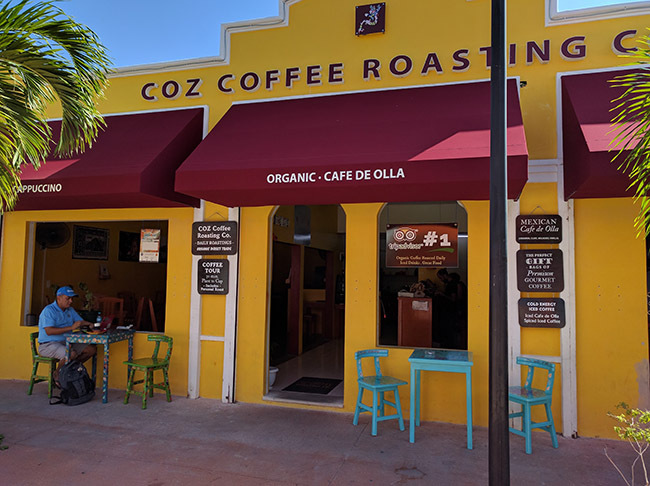 I really wanted to stay, and at many points during the day we talked about our often discussed thoughts about moving to Cozumel for some time and enjoying the locals and taking in island life. No wishing or planning changed that it was time to head back though, and a $2 cab ride later we were back to the pier in time to take some pictures of the Empress at night. Part of what made the shots unique is that despite being there 30 minutes before all-aboard, there was literally no one else on the pier, it seems that the darkness made everyone head back to the ship. Exhausted from a fun day, we showered and then headed to the Windjammer for dinner as we watched the city lights get smaller and smaller. This is when I realized that the next time we see land it will be Tampa, and our cruise will be over. Luckily we have another day left, so I'm enjoying it with friends in the Schooner bar as I type this. Once again the activity level on the ship is very low. 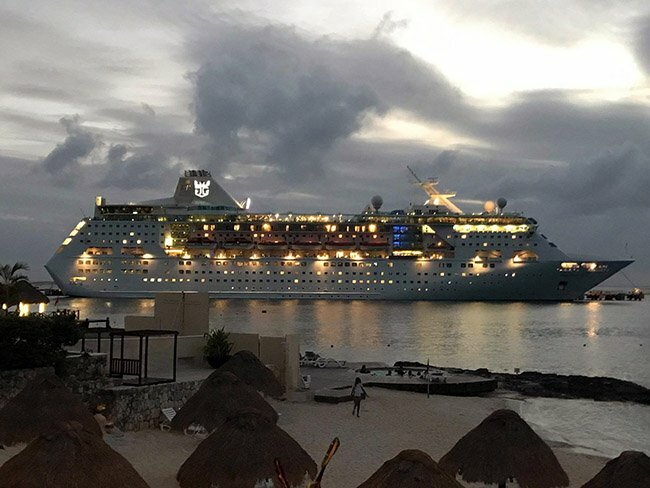 Friends who have sailed on this ship recently found a lot of energy at night, but that doesnât seem to be the case on this sailing, perhaps because the Cuba itinerary attracts a more subdued crowd. Two of my favorite things on cruisers are visiting great destinations, and going nowhere, so I'm perfectly happy to have a sea day where we can just relax, and hopefully enjoy Boleros a bit, which I've not spent enough time in. 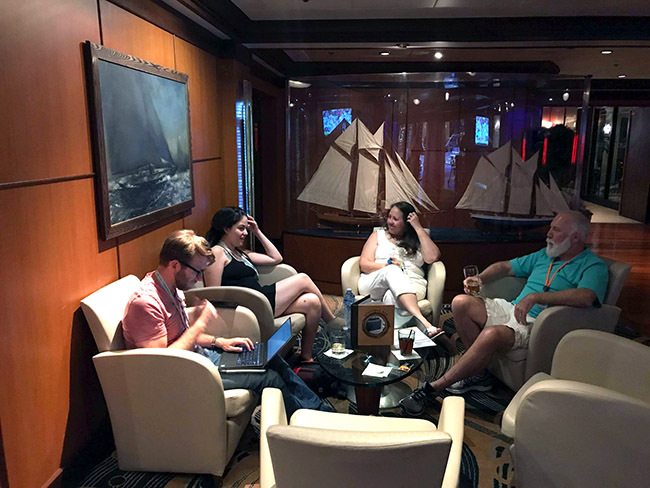 We've also not caught any of the onboard entertainment (except for in the Schooner Bar), so hopefully we can reconcile that, and maybe even enjoy the pool. I often have Mexican Pesos on hand, and while taxi prices are fixed from the cruise terminal, elsewhere they're quite negotiable, and much lower. Rates become even lower with an attempt at Spanish and Pesos in hand. I've said it before, but it's always impressive how great Cozumel is when you just step a few feet off the main drag. Usually in Cozumel the line I hear from shop-owners is "almost free!" but we only heard it once today. In a funny was I kind of missed this. Everyone on the ship keeps talking about how great Cuba was. I'd love to see the repeat rate for Cuba sailings, I bet it's very high. We changed time last night, which I prefer. Staying on local time, to me, avoids confusion. Last week the ship did not change time, which seems strange. The Windjammer was good (especially the crepe bar), but I didn't realize until after dinner that there is a sign noting that there is vegetarian curry and other options available upon request. Is curry *always* available? I may move onto this ship and work remotely! The drink card was available today for a price I'd not yet seen: 10 drinks for $59! That's a great deal, and I'm guessing the demographics and number of those with Diamond perks means they haven't sold many drinks.